Designed to resist the lateral pressure of soil when there is a desired change in ground elevation that exceeds the angle of repose of the soil. 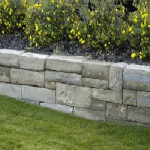 Retaining wall construction is sometimes necessary to prevent disaster. 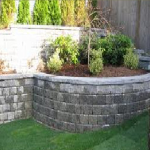 A basement wall is thus one kind of retaining wall. But the term usually refers to a cantilever retaining wall, which is a freestanding structure without lateral support at its top. These are cantilevered from a footing and rise above the grade on one side to retain a higher level grade on the opposite side. 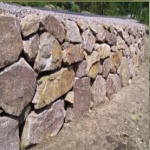 The walls must resist the lateral pressures generated by loose soils or, in some cases, water pressures. 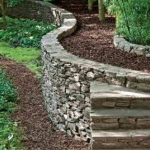 Every retaining wall supports a “wedge” of soil. The wedge is defined as the soil which extends beyond the failure plane of the soil type present at the wall site, and can be calculated once the soil friction angle is known. As the setback of the wall increases, the size of the sliding wedge is reduced. 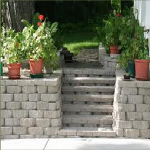 This reduction lowers the pressure on the retaining wall. 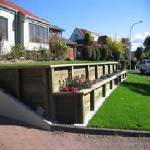 The most important consideration in proper design and installation of retaining walls is to recognize and counteract the tendency of the retained material to move downslope due to gravity. This creates lateral earth pressure behind the wall which depends on the angle of internal friction (phi) and the cohesive strength (c) of the retained material, as well as the direction and magnitude of movement the retaining structure undergoes. Lateral earth pressures are zero at the top of the wall and – in homogenous ground – increase proportionally to a maximum value at the lowest depth. Earth pressures will push the wall forward or overturn it if not properly addressed. Also, any groundwater behind the wall that is not dissipated by a drainage system causes hydrostatic pressure on the wall. The total pressure or thrust may be assumed to act at one-third from the lowest depth for lengthwise stretches of uniform height. Unless the wall is designed to retain water, It is important to have proper drainage behind the wall in order to limit the pressure to the wall’s design value. Drainage materials will reduce or eliminate the hydrostatic pressure and improve the stability of the material behind the wall. 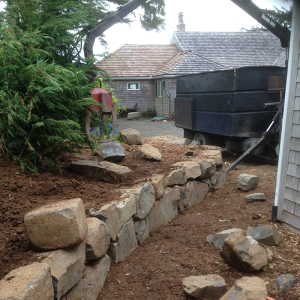 Drystone retaining walls are normally self-draining. 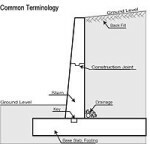 As an example, the International Building Code requires retaining walls to be designed to ensure stability against overturning, sliding, excessive foundation pressure and water uplift; and that they be designed for a safety factor of 1.5 against lateral sliding and overturning. Young’s River Trees constructs seven to ten walls per year, both large and small. 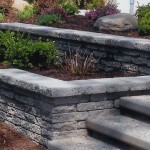 We specialize in Retaining Wall Construction and drain walls. If you are looking at repairing or replacing an existing wall, or a new installation, please call us for a free estimate. Tree Service Company | Powered by Mantra & WordPress.